The beautifully-styled Assure irons look strikingly different with their dual flanged sole and give you twice the confidence to hit pure shots. The heavy weighted sole acts like a stabilizer and allows the club to glide easily through the turf. This unique design allows you to get the ball in the air and prevents digging or fat shots. Excellent very forgiving golf clubs. 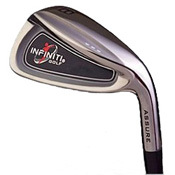 I was fitted by an infinity dealer 10 years ago and still love these clubs.